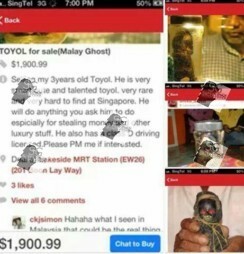 Singapore Guy SELLING BABY GHOST At Lakeside MRT. Want To Try? 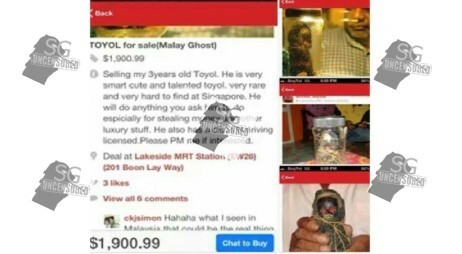 You are at:Home»Caught In The Act»Singapore Guy SELLING BABY GHOST At Lakeside MRT. Want To Try? Someone posted TOYOL for sale. Selling my 3 years old Toyol. He is very smart cute and talented Toyol. Very rare and very hard to find at Singapore. He will do anything you ask him to do. Especially for stealing money and other luxury stuff. He also has a class D driving licensed. Please PM Me IF INTERESTED!!. Previous ArticleTree Falls At Liang Seah Street. Nowadays Trees Falling Is A Trend? Next Article AVA Slaughter The Chickens, Prevents Bird Flu. Then Bird Park How? Birds Flying In The Sky how?